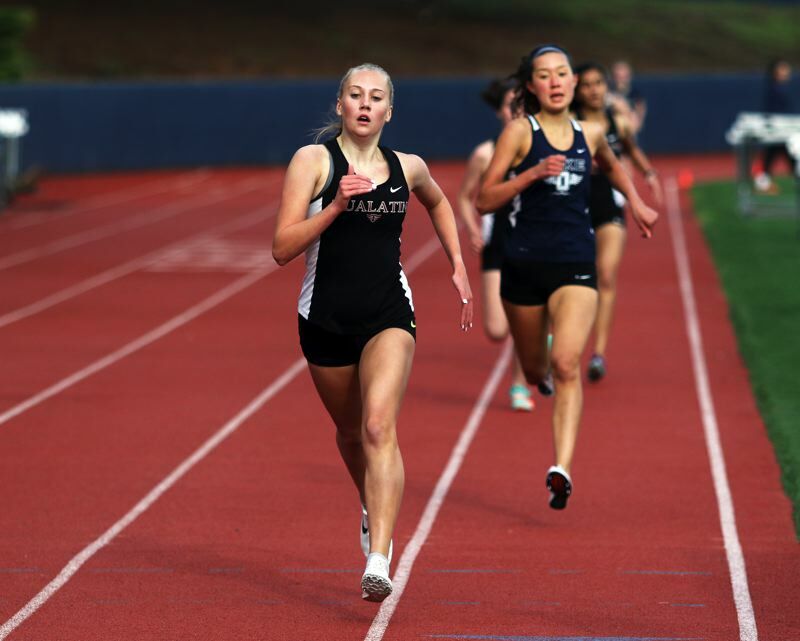 LAKE OSWEGO — The Tualatin High School girls track and field team was definitely looking strong to start the Three Rivers League season. But, for the Timberwolves, the team within the team seems to be downright impressive — super impressive. 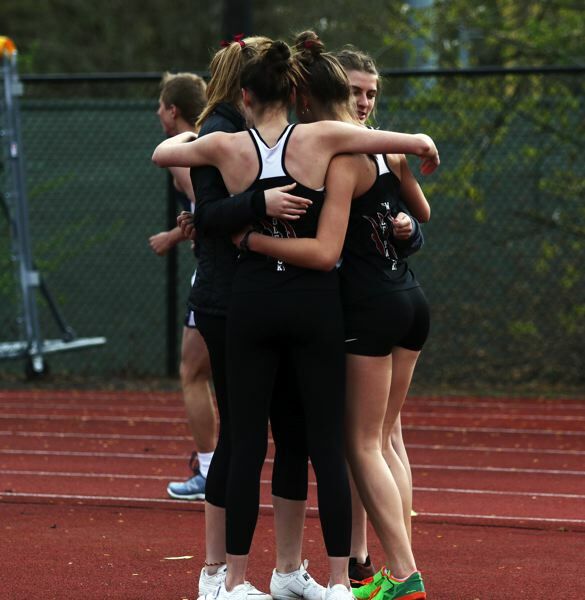 Tualatin's team of long jumpers got off to a soaring start in league competition, and the Timberwolves look to keep soaring as the season goes on. "We're all super close," Tualatin sophomore Ellie Hammond said during the Wolves' league-opening dual meet at Lake Oswego. "We practice together all the time and we're all family. We all support each other, and that makes it easier to jump." "We support each other through everything," Tualatin junior Corona Parker said. "We cheer each other on, and we critique each other and help each other any way we can, because high jumping is such a mental sport. When you have people supporting you cheering you on, and telling you to get out of your head and just jump, because you know what you're doing, it really helps." 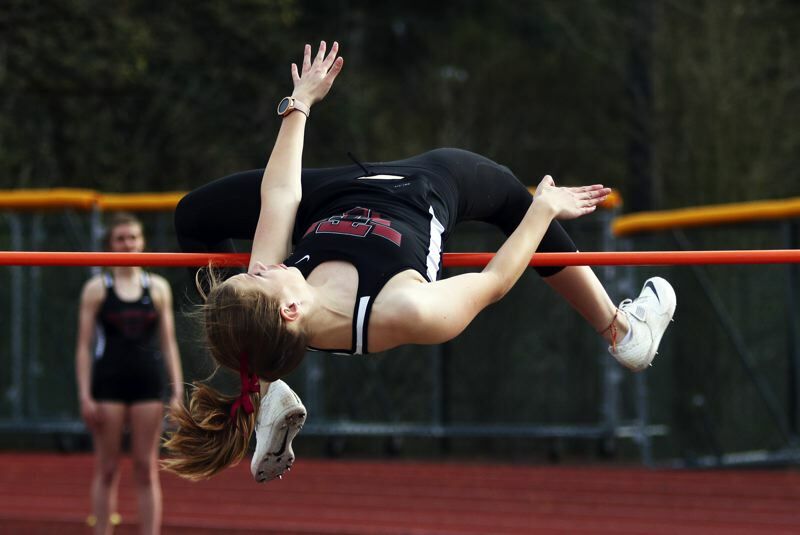 The Tualatin girls, with the high jumpers helping to lead the way, scored a 79.5-64.5 victory over the Lakers in the TRL-opening meet held on April 4. The Wolves' four high jumpers, Hammond, Parker, senior Sydney Oleson and junior Savannah Taft, got their league season off to a strong start. "It went awesome," Hammond said. That was especially true for Parker. Even though she technically was in the junior varsity competition, Parker, who jumped alongside the varsity competitors, had the top mark of the day, clearing a personal-best height of 5 feet, 2 inches. "My previous (personal record) was 5-foot, so this was a huge PR today," Parker said with a smile. "That was really cool. I've been stuck at 5-foot for quite awhile, so this feels really good." Parker came through twice in the clutch to set her new personal best. She cleared 5-1 on her third, and final, attempt at that height. She also got over the bar at 5-2 on her third try at that height. "It was a big surprise, because I went up and hit my shoulder on it, and I was like, 'oh well, that was a great third attempt, and I know I hit it (the bar), and it's probably down,'" Parker said. "But it stayed up, and I was really proud of it. When I cleared it, it was just a huge wave of emotion for me." "I was really happy for her," Hammond said. "I was so glad. I love to see my teammates PR." Hammond cleared 5-0 at last week's meet, and was the varsity winner on the day. Hammond, who qualified for the Class 6A state track and field championships in the high jump as a freshman last year, is looking for big things again this year. "I'm looking to PR and go to state and hopefully medal," she said. Oleson and Taft each cleared 4-10 at last week's meet. "This is so much fun. We all love high jump so much, and we've just bonded over it," Parker said. "When I was a freshman, it was Sydney, Savannah and I. And last year, Ellie joined us, which I was really glad for, but she's such a great jumper that it bumped me to JV, and I wasn't able to jump as much. But this meet proved to me that I'm fully capable, and a worthy jumper, and I'm part of this team. That was really important to me." Taft also picked up a pair over victories in the hurdles events in the meet at Lake Oswego. She took first place in the 100-meter high hurdles in a time of 17.67 seconds, and she triumphed in the 300 low hurdles in 52.82. Also for the Wolves, senior Gennavieve Marion sprinted to victory in the 200 in 27.41, sophomore Olivia Seits had a winning time of 2:26.89 in the 800, freshman Paige Olson took first place in the 1,500 in 5:32.76 and sophomore Rachel Beddes won the 3,000 in 11:47.46. The Tualatin team of Marion, senior Keara Bingham, senior Jessica Olson and sophomore Tori Kneeshaw won the 4 x 400 relay in 4:26.86. 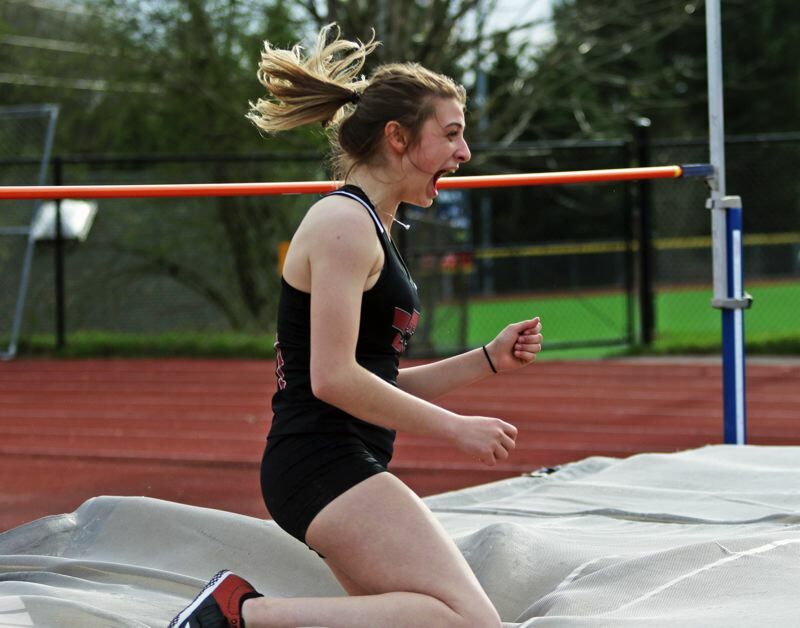 In other field events, Tualatin freshman Brook Burke won the javelin event with a throw of 93-5 and sophomore Maile Johnson cleared 8-0 to take first place in the pole vault. 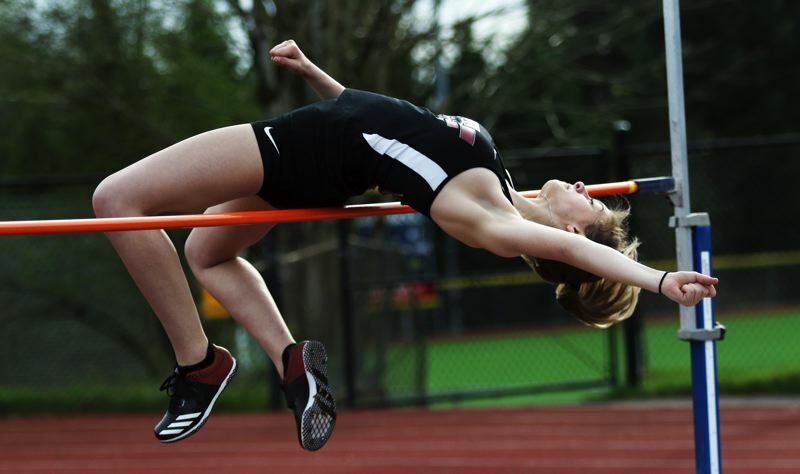 On Friday, the Tualatin girls took eighth place in the team standings, out of 17 schools, at the Chehalem Track and Field Classic, held at Newberg High School. At that meet, Tualatin junior Kaitlyn Gearin ran to victory in the 3,000 in a time of 10:41.53. Taft cleared 5-2 to take third place in the high jump. Hammond was fifth with a height of 5-1. Timberwolf sophomore Kendel Vanterpool was fifth in the triple jump at 34-0.5. The Tualatin girls will be back in action on Friday, when they host Lakeridge and St. Mary's Academy in a Three Rivers League double dual meet starting at 4 p.m. at Tualatin High School.